John Hawkins at Right Wing News posts on Blogging While Female-Part 2. It seems the same happens on your blog as well, Dr. Helen. The most unpleasant people are almost without fail, of liberal persuasion. Yelling, insulting, acting out. What's that all about? It begs to be returned in kind, and sometimes I bite. The biggest thing I do not understand is why they do what they do. As one who is not of that line of thinking, why venture to those types of blogs, and enter to flame the whole place? It does not occur to me to do so. I just have no interest so don't go at all. The one left of center exception [for me] is Tammy Bruce. Her beliefs and mine often part ways early. However, she does possess common sense (like she says) and is fair minded. 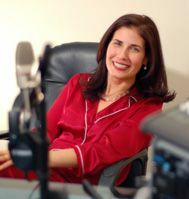 She is almost always a good read, and I try to catch her on the radio when I can. And if anyone has seen it from "both sides", it's her. Michelle Malkin, however, is my favorite in the purely political arena. She does a great job filling in for O'Reilly. Better than he is by a long shot, in my opinion. But if we are talking about the Blue Ribbon, well that belongs to this blog. People with a secure attachment history can think while they are upset. Their orbitalfrontal cortex mediates their amygdaala, allowing them to reason. People with an insecure attachement history have a markedly less developed orbitalfrontal cortex, so they have no brakes for their amygdala. The amygdala is where rage and panic come from. So with no effective brakes, these poor folks go into a neural hijacking where their fear and rage overwhelm their reason. They literally cannot think when upset. It is sad. But it is dangerous when people try to act out their abandonment fears on the government by turning the feds into all powerful, all protective mother. The feds are not up to the challenge and those of us with secure attachments who can and prefer to take care of ourselves end up with the intrusive "nanny" state. I leave it to you to draw conclusions concerning party affiliations and hot button political issues that are poisoned by these poorly integrated limbic/frontal lobe systems. Very interesting. I like Mary Katharine Ham. I remember her being on Hugh Hewitt's blog before he joined Townhall. There was a pop that she really liked and was hard to find, I think vanilla coke. Is he going to interview you in a future edition? As far as mean commentators goes, I used to hang out at the Straight Dope Message Boards: boards.straightdope.com/sdmb/ They are overwhelmingly liberal and pro-gay marriage and I was frequently angry why visiting. Another one I used to visit was: FWIS (it kind of broke off from Bad Astronomy): http://www.loresinger.com/FWIS/index.php There was a mixture of views there, including some really friendly conservative atheists. There seemed to be a strong libertarian tendency. However there was one woman that really ticked me off. She claimed to be a libertarian, but seemed to hate conservatives. I've been reading this blog for probably about 2 years and most of the time I really enjoy being here. Yeah, I know what you mean, Trey. Sometimes in extended discussions with liberal types, I blow my hemoflobulator valve and it takes two dreamsicles and a Brisk Lemon Iced tea to calm back down. Or beautiful women blogging, for the non politically correct. @br549: "The most unpleasant people are almost without fail, of liberal persuasion. Yelling, insulting, acting out." Burt Prelutsky published a 12-step program to recover from liberalism. I like his Step No. 1: "It is high time that every American be guaranteed the right to speak freely. It is not reserved solely for left-wing college students who wish to take advantage of the First Amendment to shout down conservatives. At the same time, they must not construe the conservative's right to dismiss them as arrogant idiots as censorship." I lost most of the respect I had for Michelle Malkin when she avoided dealing with Vox Day's rebuttals of the points in her book on the Japanese internment, and then tried to pass it off as some sort of "I had already addressed his points, moving on..." She is actually not nearly as good or intellectually honest as her supporters think she is, which is why I find it ironic that she is idolized by so many. They alluded to the point that liberal women are some of the prime culprits for the abuse, but let's face it. Female liberal bloggers are some of the nastiest women you'll ever see online. They only get a free pass from other liberals because they are liberals. No other group would associate with writers as vitriolic and in-your-face as some of the writers at blogs like Feministe, Pandagon and Feministing. As mentioned in Hawkins' interview, there probably are just not as many women blogging as men. Is that a bad thing, though? Just because you can express yourself on a blog doesn't mean you should. Well, Trey, if you're reading, you've got my gears turning (again). I am now wondering if those who want a nanny state, most being left wing, most being liberal - as those are the one's who want a nanny state - were "latch key kids" growing up. Even at my age, many children I knew in school had both parents working, and were told to go home from school, go into the house and lock the doors and stay there 'til mommy or daddy got home. Don't let anyone in, don't go out to play, don't answer the phone. And if the parents were divorced and mommy was working, it was even worse. Before school and after school programs that are really baby sitting by gov't began in those days as well. In the suburban neighborhood I grew up in divorce was not a common thing. If it did occur (I'm sure it did) the family moved, as the house needed to be sold. Plus only a few of the mothers worked. Most, like my own, never worked. I went to a neighborhood school in elementary years, and so was only exposed to my own settled neighborhood. Going to middle and high school later on is where the "mix" started showing up. More mixtures of various backgrounds and family lives. More bullies and "loose girls", if you will. Regardless of race or ethnic background, the bullies and "loosies" came from broken homes and poorer neighborhoods. Perhaps this is old news to most people. Or perhaps I've led a sheltered life.